Located just south of Thailand on the Malay Peninsula, Malaysia is a tropical paradise in the heart of southeast Asia. It’s perhaps best known for its beaches, rainforests, and its wealth of natural beauty and impressive scenery. The capital, Kuala Lumpur houses the tallest twin towers in the world, while its islands are home to some of the most beautiful dive areas you can see. Whether you’re up for trekking and diving, or just want to relax on the beach and dine in the city, Malaysia is certainly worth a visit. Electricity Socket: 240V AC electricity. Power outlets are three-prong sockets (type G). Be sure to pack a universal travel adaptor so you can still use all your electronic gadgets. Visa: Traveling to Malaysia is easy; for citizens of most countries you won’t need to apply for a visa beforehand. There are a handful of countries in Asia that require a visa for Malaysia, but most will not. For most of Europe and North America, you’ll receive a 90-day visa stamp upon arrival; certain other countries are only valid for 30-days. Just make sure your passport is valid for at least 6 months after your entry. Safety: Most parts of Malaysia are incredibly safe to travel in. The exception is Eastern Sabah, on the island of Borneo as there has been an increase in kidnappings on the coast in this region. Steering clear of that area, you should be able to have a safe and enjoyable stay in Malaysia. In big cities like Kuala Lumpur, pickpocketing and petty theft can be a problem, so keep your belongings close. Obviously, don’t travel without travel insurance! We would suggest checking out World Nomads, for travel insurance as they have the best coverage for active travelers. Language: The official language of Malaysia is Malay, which is spoken in the vast majority of the country. English is widely spoken as well, though, so it’s easy enough to get by without knowing how to speak Malay. Festivals and Celebrations: Malaysia and Singapore share a lot of the same festivals and traditions, but Malaysia definitely has its own flair. From brightly colored street festivals to sobering religious days, the country has a lot to celebrate with its own unique cultural heritage. Hari Raya Aidilfitri: This traditional Muslim holiday is celebrated at the end of Ramadan (in June). After a month of fasting, Malaysia’s Muslim population are ready to celebrate! The festival is marked by feasting, journeying from big cities back to small towns, and welcoming guests and friends into homes. You’ll find lots of traditional Malay dishes and decadent desserts around this time. 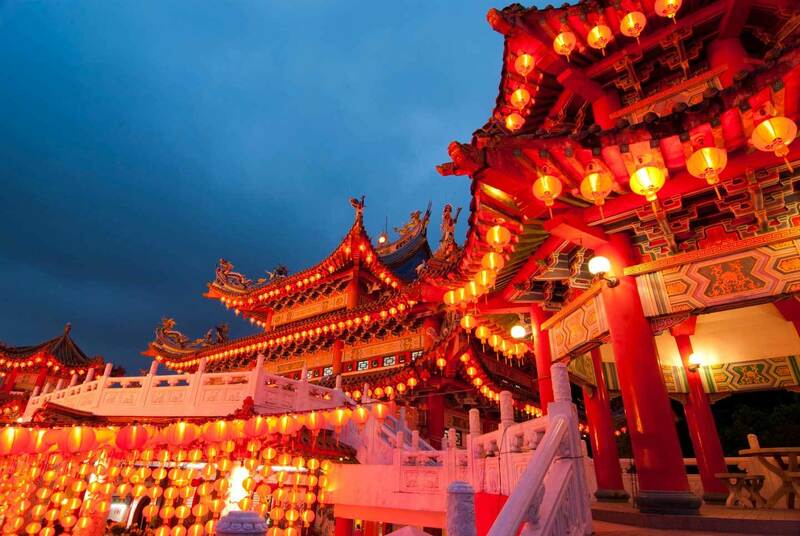 Chinese New Year: There’s a big Chinese population in Malaysia, and they’re definitely not going to forget their heritage on this exciting holiday. Happening in January or February, this event turns the city red, and you’ll see everything from parades and festivals to street vendors, and performances in all the major cities. Vesak Day: An important holiday for the Buddhist community in Malaysia, Vesak Day occurs in May and celebrates the birth, enlightenment, and death of the Buddha. While this is definitely a more solemn holiday than the New Year, temples and shrines will still be brightly adorned, and other events like vegetarian food fairs and talks will be happening, too. Deepavali: Deepavali, or the Festival of Lights, celebrates the triumph of light over dark and good over evil in the Hindu tradition. During this celebration (usually in October or November), the Indian community in Malaysia makes the cities come alive with bright lights, vibrant colors, and high-energy festivities. 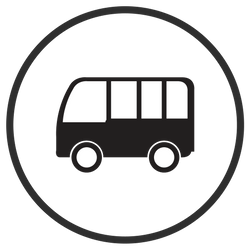 Transportation: The transport from one place to the next is fairly easy in Cambodia and is quite efficient. We recommend downloading the Skyscanner App and using the 12Go website to view bus, boat, and train schedules ahead of time. Malaysia experiences high heat and humidity all year-round, and there isn’t a lot of distinction between the seasons. The most notable difference is that the monsoon season arrives in November/December and brings on the “rainy season” until mid-February. During this time, travel is not recommended on the East coast of the peninsula (unless you’re happy staying indoors all afternoon!). An important distinction, though, is that while the East coast experiences extremely wet weather during this time, the West coast works on a different timeline. The West Coast’s rainy season goes from April to October, and while it lasts for a longer time, the weather is milder and the rain won’t have much effect on your travel plans. The nice thing about the alternating wet seasons, you can visit Malaysia at any time of the year and have a pretty enjoyable beach holiday. Just be sure to align your travel plans with the right areas of Malaysia, or else you might find your beach vacation rained out! Travel in Malaysia is pretty affordable. A little pricier than some other areas in Southeast Asia, but still far less than any western countries. If you’re happy sleeping in a hostel and eating street food, you can easily get by on $30 a day. If you want to splurge on a nicer hotel or a few gourmet meals, you might want to budget up to $40 or $50 (or more if you’re used to a more western lifestyle). The biggest thing to remember when packing for Malaysia is that it is going to be hot, humid, and often wet. Bring lightweight, breathable clothes, and pack an umbrella! While the cities are used to foreigners and are more relaxed, if you’ll be traveling in more rural areas outside the major metropolitan areas, it’s a good idea to wear more modest attire. Malaysia is a primarily Muslim country and it’s not likely that your Speedo or string bikini will go over too well in a little Malaysian village. Dress a little more conservatively if you want to be accepted and welcomed. A light jacket or sweater is always a good idea, especially when the freezing cold air-conditioning in restaurants and shops feels like winter compared to the heat outside! For more details, check out our ultimate Asia packing list guide featuring everything you would possibly need for a trip to this region. 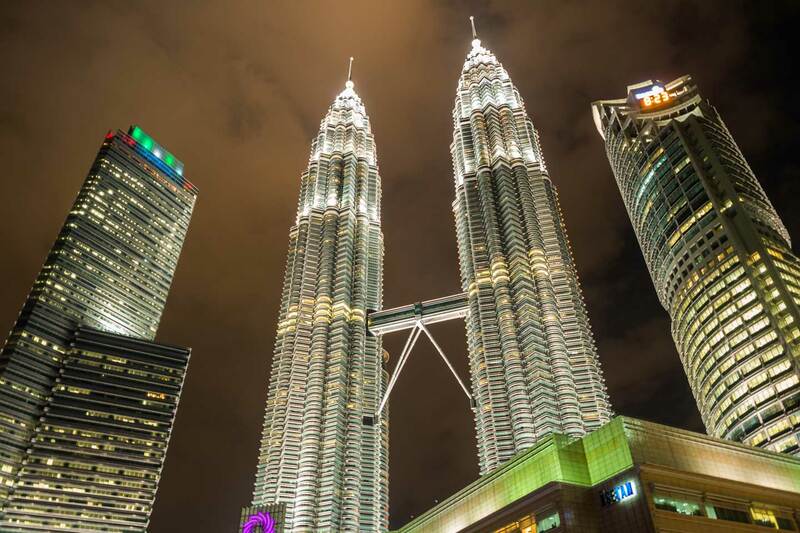 One of the most recognizable spots in Malaysia, the Petronas Towers are the tallest twin towers in the world. The sky bridge that connects the towers is the world’s tallest two-story bridge. As long as you’re not afraid of heights, you can get tickets to the sky bridge to check out some amazing views of the city, or go even higher to check out the viewing deck from the 86th floor. Next to Thailand, Malaysia, in my opinion, has some of the best cuisines in Asia. 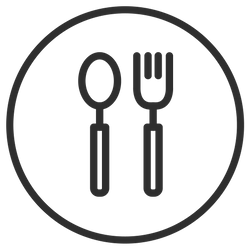 Seize the opportunity to get to know more of the incredible flavors of Malaysian cuisine by taking cooking classes in Malaysia which will give you all the info you need on how to make the best laksas and rendangs. This natural wonder is one of the world’s oldest rainforests, estimated to be around 130 million years old. Whether you’re looking to set out on a 100km trek, or just take an afternoon stroll, this is the perfect spot to explore. Rock climbing and canoeing are available in this area, too! 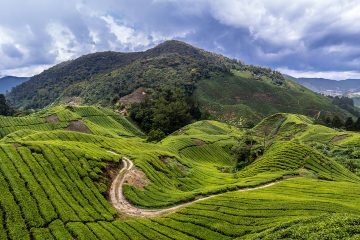 If you love nature and the outdoors, you can also opt to go trekking in the Cameron Highlands. Consisting of three huge limestone caves, this area is actually a cave temple. There are 272 steps to get up to the temple, but most people will agree that the sights are worth it. If you’re in Malaysia for the Thaipusam celebration, you can glimpse thousands of devotees carrying offerings to the temple. This is a great place to get a peek into the rich cultural history of Malaysia in Sarawak. You can learn about the different cultural groups in Malaysia, see performances, music workshops, artwork, and lots more. It’s a different side of Malaysia from the hubbub of Kuala Lumpur or Penang, but it’s definitely worth a visit. If you need a little R&R while you’re in Malaysia, head for the beaches. 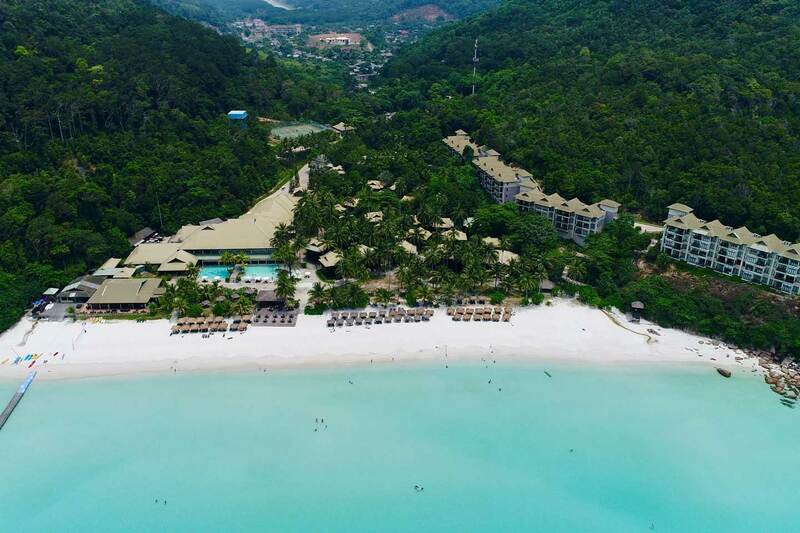 Langkawi Island in the Andaman sea is the perfect spot to relax and soak up some sun. They’ve got everything from hostels to extravagant resorts and everything in between. Take a couple of days and enjoy some of the incredible seaside beauty of this island. If you’re up for a little more adventure and excitement, check out Redang Island. But if you haven’t already, you’ll definitely want to get your scuba diving certification first. The waters around this island are home to 31 incredible dive sites, including a few impressive shipwrecks you won’t want to miss. The waters along the Perhentian Islands are also world renowned and worth exploring. 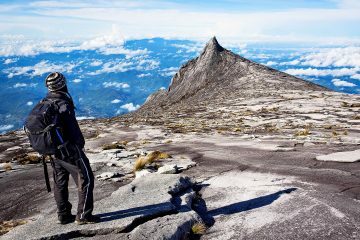 If you’re up for a bit of adventure, why not challenge yourself by climbing up Mount Kinabalu in Borneo. 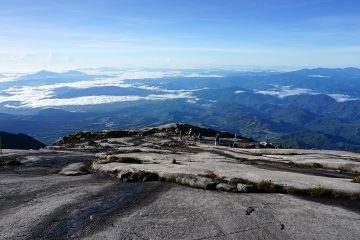 You can opt to conquer this trek via the regular route or opt to do Mount Kinabalu via Ferrata as you ascend a series of ropes and iron bars to reach the peak. Another must-do while in Malaysia is to see the famous street art in Penang. Everywhere you go, you will find countless street murals often depicting children in various poses. The art is absolutely gorgeous and unusual, making it a fun city to explore and walk around in. Simply put, this is just rice soaked in coconut milk and steamed. But it’s always served with a mountain of sides, from hard-boiled eggs and peanuts to vegetables and meats. It’s a simple dish that’s got the perfect combination of spicy, sweet, and delicious. Basically a rice flour pancake, this dish is filled with sugar, peanuts, corn, or all three. The ingredients are spooned onto a doughy center while the outside cooks to a crispy perfection, then it’s served up, often folded in half like a taco. This is easy to find at street stalls and is a cheap and satisfying snack on the go. You’ve probably had satay before and if you have, you know how delicious it is. Skewers of chicken, beef, or pork are painted with peanut sauce and grilled to perfection. You can find similar skewers in other countries, but they just don’t compare to the authentic thing in Malaysia. 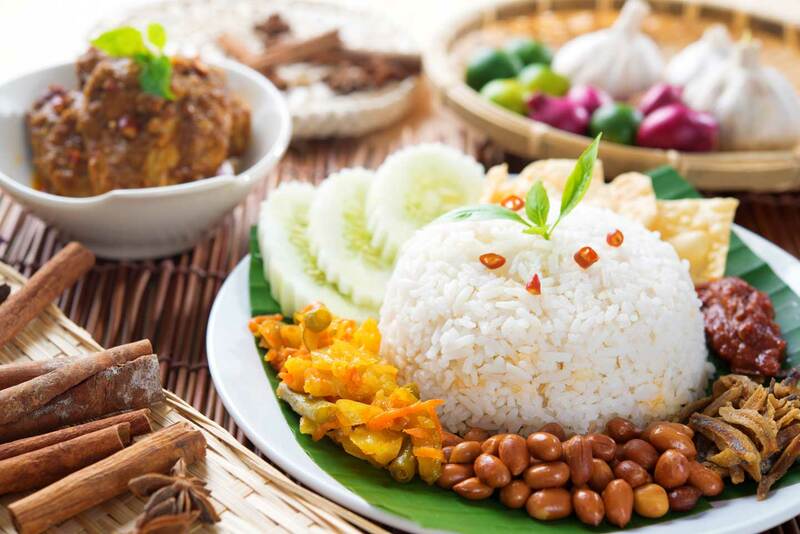 A popular breakfast food in Malaysia, Nasi Danang features rice cooked in coconut milk with fish curry and a spread of added ingredients like hard-boiled eggs, shaved coconut, and pickled vegetables. From $3 hostels to $100 hotels, Malaysia has a huge variety of accommodation options. Cities like Kuala Lumpur and Penang will have the best variety, but will also be more expensive. In more rural areas you’re most likely to find simpler accommodations like basic guesthouses. 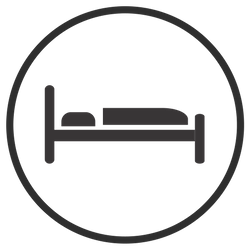 If you’re traveling during peak season or holidays, it is best to book your accommodations in advance. We recommend checking sites like Booking.com, Agoda, or Hostel World. No matter where you stay, you’re almost certain to experience the wealth of Malaysian hospitality. It’s an amazing place to visit! If private apartments are more your thing, you can also look at renting a villa while in Malaysia via Airbnb. Check out our full article on how to get $45 coupon code for your booking or simply click here to get our coupon code. When traveling around Malaysia, we recommend using the Skyscanner App or looking at the Bookaway or 12go website so you can prebook boats, buses and ferries. In terms of safety, traveling around Indonesia is relatively safe but just to be sure, make sure you have travel insurance during your trip. We recommend World Nomads mainly because they cover a lot of adventure activities like diving, snorkeling, etc. Click below to get a quote.